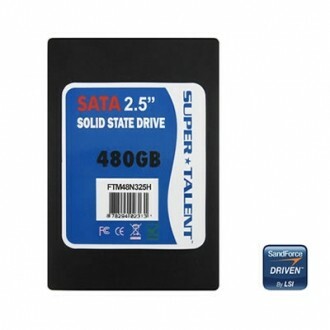 Super Talent has announced their fastest 2.5-inch solid state drive to date. The SATA3 TeraNova line uses a SandForce 2200 processor with optimized firmware to create what they call a blistering fast SSD available in multiple capacities. The company says they have optimized the transfer rates at various queue depths to deliver extreme performance in unique environments, both sequentially and randomly. They claim the drive performs better than other SSDs when running standard applications like Photoshop, Miya and 3DS Max. Furthermore, the line is said to include new technology called DuraWrite that will extend the life of the drive, an issue that has concerned many since the mainstream adoption of SSDs over the past few years. DuraWrite increases endurance with super low write amplification, state-of-the-art wear leveling, bad block management and ECC with up to 24 bits correctable per 512 byte sector. Specifications were surprisingly hard to come by but SlashGear somehow discovered late last year that drives have a max sequential read speed of 540MB/sec. Write speeds vary between 480MB/sec and 520/sec depending on capacity. Speaking of capacity, Super Talent’s press release notes 60GB, 120GB, 240GB and 480GB capacities although SlashGear’s specs list a 64GB drive, not a 60GB. Further adding to the confusion is the mention of both MLC and SLC NAND flash on the TeraNova product page. We have reached out to Super Talent for clarification on the rated speeds, capacities and NAND type but as of our publication deadline, they haven’t got back to use. We will update this story accordingly when we do receive a reply.